Yet absent from most of the commentary is any mention of cities in China. This is perhaps due in large part to the lack of serious social problems in comparison to its developing city counterparts in other countries. If a megacity is defined as a city with a population of more than 10 million, then China is home to 5 megacities: Shanghai, Beijing, Shenzhen, Guangzhou and Dongguan. As the country continues to urbanize, more Chinese cities are bound to join the ranks of these megacities. How have China’s cities avoided these issues? Western media continues to bawl over the amount of new residential construction in China, calling it the ”biggest bubble ever.” I have pointed out before how this might be an overestimation of the problem and that the housing market is actually more stable than many think. One thing is clear: the ample construction of new housing units in cities across China remains the essential component leading the way in the country’s development. The ability to provide modern accommodations for millions of aspiring urban dwellers has also directly prevented the proliferation of slums and large-scale shantytowns. The ability to move efficiently through an urban area is paramount to opportunity and quality of life. When one thinks of megacities such as Jakarta or Mexico City, automobile gridlock often comes to mind. Beijing might have its traffic problems as well, but China’s development of public transportation, including extensive underground subway networks, ensures citizens will have other options to move around besides motor vehicles. The more connected by different forms of a transportation a city is, the more opportunity people have to live where they want and have access to a wider geographic range of job options. The often-overlooked reality of zoning and land-use regulations plays a much greater role in the shaping the character of megacities then it is given credit for. Mumbai’s draconian 1.33 floor-to-area ratio (FAR) throughout most of the city means that it is limited to construction of low-rise buildings,leading to the growth of overcrowded sprawling slums. Chinese cities, in contrast, allow for high FAR, promoting construction of high-rise buildings that leave room for ample green space. Furthermore, Chinese cities are not limited by ”urban growth boundaries” and allow development to occur on newly annexed land outside of traditional urban cores. Even traditionally ”dense” cities like Shanghai and Hong Kong allow for new development outside of their traditional centers: the Pudong New Area in Shanghai and the New Territories in Hong Kong are huge areas that are still largely underdeveloped when compared to their respective downtown areas. Critically, these nominally suburban or even “exurban” expansions are not mere bedroom community; they are frequently attached to areas of intense commercial, industrial and technical development. 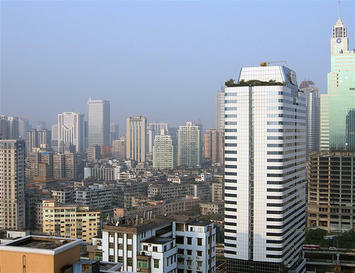 In many cities, including Chengdu, where I reside, most of the new economic growth takes place in such communities. As China enters its third decade of rapid development, competition is heating up between its cities for domestic and foreign investment. The winners will ultimately be cities that are most business friendly and offer incentives like tax breaks to companies looking to set up operations. Many of China’s cities have gone about this by establishing special ‘economic and trade zones’, usually outside of traditional urban cores. As a matter of fact, one of new China’s most economically successful cities, Shenzhen, largely started as a ‘Special Economic Zone’ (SEZ). Special economic and trade zones that are not actual cities, but part of a larger city, thrive because they usually built on more affordable land on urban peripheries, opening up more investment for construction of state-of-the-art manufacturing and R&D facilities. When it comes to political issues at the Central Government level, it is clear that China does not want to be told how to run its country by outside diplomats and foreign policy experts. Yet at the municipal level, Chinese government and business leaders are earnestly open to listening to experts in planning and development from outside its borders. One only needs to take a look at the countless architecture and urban planning practices from the West, Singapore and even Taiwan who currently work in China. This open exchange of ideas taking place is what allows best practices to come to fruition. Adam Nathaniel Mayer is an American architectural design professional currently living in China. In addition to his job designing buildings he writes the China Urban Development Blog, where a version of this piece originally appeared. Submitted by david watson on Thu, 05/07/2015 - 16:40. Submitted by johnz308 on Sat, 05/02/2015 - 13:17. Submitted by david watson on Wed, 04/22/2015 - 08:07. Submitted by xahgzr1122 on Sun, 04/12/2015 - 05:26. Submitted by johnz308 on Thu, 04/09/2015 - 23:44. Submitted by xijozx1122 on Sun, 03/15/2015 - 06:11. Submitted by xxdllb1122 on Mon, 03/09/2015 - 06:13. Submitted by xxdllb1122 on Mon, 03/02/2015 - 09:28.